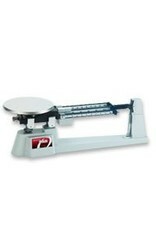 The Ohaus Triple Beam Balance (760-00) is well-equipped to handle any weighing job, whether youÃ¯Â¿Â½re weighing solids, liquids, powders or even animals. 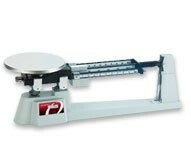 The top loading Triple Beam Balance Series is known world wide as for its durability and versatility to accommodate a range of lab applications. Capacity: 610 g. Readability: 0.1 g. Ã¯Â¿Â½Ã›Â¢ Tare beam to offset the weight of containers up to 225 g to be balanced out Ã¯Â¿Â½Ã›Â¢ Durable Stainless Steel platform Ã¯Â¿Â½Ã›Â¢ Three notched and tiered beams with center reading Ã¯Â¿Â½Ã›Â¢ Spring loaded zero adjust compensator Purchase of Optional Mass Set (Item #SC1760A) will allow weight up to 2,610g in the same 0.1g increments.